go ducks! | come blow bubbles! so the oregon ducks is really the one sports team that brandon cares about. well, i should say he cares about their sports teams, plural. 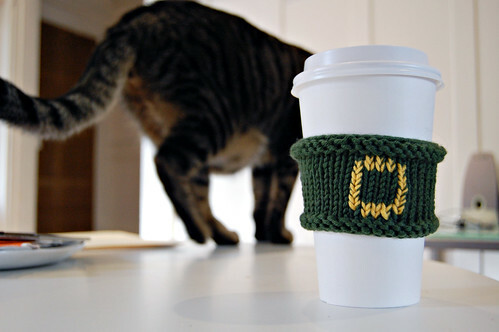 anyway, i had experimented the other day and came up with a knitted reusable coffee sleeve, in order to stop using a new paper/cardboard one every day. how green of me, right? it stemmed from me collecting the sleeves on my desk and realizing just how many i go through. anyway, i asked brandon if he’d use one, and he said if it was a ducks one, he would–thus the challenge was on. here’s what i came up with, and i’m pretty happy with the result, if i do say so myself. the hunt for the “perfect” yarn colors was NOT easy, and it took a couple tries but it was worth it in the end. seriously cute. 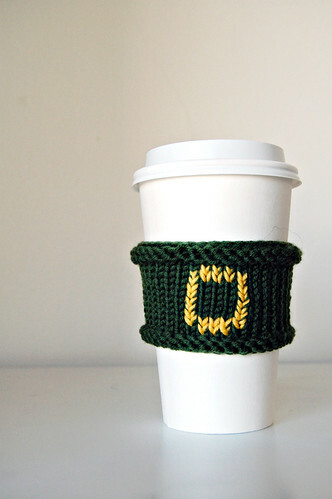 You definitely have to make some to put in your etsy store.